Hi, my name is Kerry McCullough and I have recently moved into Flowers of St John. I have come to Auckland after 23 years in Colorado to move closer to my family and escape the long snowy winters in the mountains. I have been working in the floral business for a long time now starting with an event/hotel business floral business in Vail for 15 years. I worked out of my home a I had the freedom to do floral work as it came in over the home phone and mobile. There were times when I took orders while sitting on chairlifts on the ski fields! I moved to Denver and spent 8 years there enjoying small city USA. 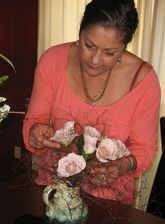 I worked at 'Bouquets' in downtown Denver with the most acclaimed florists in town. I then went on to open my own store in an "up and coming neighbourhood", lots of tattoo parlours and bars! I quickly learned flowers were not a high priority but funky furniture and lamps were. Then by accident I found that handbags and jewellery just flew off the shelves. My retail career was launched - and I loved it especially shopping at the New York and Los Angeles trade shows for the latest and greatest. I also was fortunate to meet a designer out of Manhattan and made a great connection and did many an event for Lancome, Matrix, Polo Ralph Lauren, Redken etc, over the years. We did swanky lavish parties with very little budget. It seemed glamorous but was very very hard work as everyone knows in this business. Of course that was the eighties and the nineties and I don't want to admit to this but.... I am geting a bit old for the big events and long nights. I am happy to be back in New Zealand, to be around family and be able to go to the beach on a Sunday and go fishing in the great outdoors. I will continue on with great flowers and add lots of decorative homewares for the local shoppers as well as being part of the Interflora group. If you are stuck for an idea - just give me a call (yes, this applies to Men as well) and I can help you find that perfect gift, token or sympathy gift. My number is 09 529 2677. We look forward to seeing you in the shop or handling your online orders soon.